Former Manchester United defenders Steve Bruce and Gary Pallister believe the imminent signing of Robin van Persie is a big boost for the Reds. But ex-Manchester City forward Rodney Marsh predicts the Blues will retain their Premier League crown despite losing out in the race for the £24m Dutch striker. Sir Alex Ferguson's side lost their title last season to big rivals City on goal difference and will see the arrival of Van Persie, 29, as significant on the eve of the new season. However, Marsh still regards City as favourites and thinks United's capture of Van Persie has a hint of "desperation" about it. "Van Persie is Ferguson's last-ditch effort to reclaim the title back from Manchester City," Marsh told BBC Sport. "It tinges a touch of desperation on Manchester United's part based on the fact that they have spent an incredible amount of money for an ageing player." Marsh, who scored 36 goals in 118 appearances for Manchester City between 1972 and 1975, also believes the signing shows the size of the threat posed to 70-year-old Ferguson by Mancini, 47. 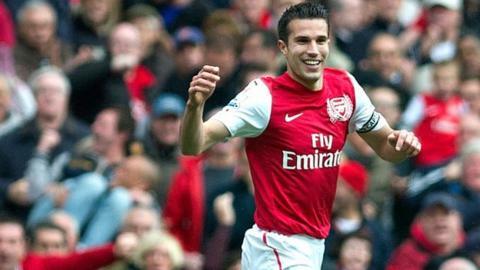 And he says the move to United for former Arsenal striker Van Persie is a mistake. Marsh believes Ferguson is reaching the end of his career and the Scot will not be in charge for the length of Van Persie's four-year deal, whereas Mancini will be around for much longer. "I thought Ferguson did fantastically to get United within one game of winning the title last season," Marsh said. "But I do feel that he's looking at Mancini and the players that City have, and he's like a magician pulling rabbits out of a hat trying to compete. "More power to him, because I'm his biggest fan, but it does seem he is now threatened by the new sheriff in town and he's going to try and slap him down." As well as being favourites to win the Premier League, Marsh thinks Mancini's side can challenge for the Champions League too, despite only signing former Everton midfielder Jack Rodwell so far this summer. In addition to Van Persie, Ferguson has also signed ex-Borussia Dortmund player Shinji Kagawa and Crewe's Nick Powell. Marsh added: "I still feel City are the favourites, they are the team to beat. But when you throw in the wildcard of Van Persie, he is probably the one player that could take Manchester United back to the top. "Nothing has changed my mind about Manchester City. Through all the blips and bumps last season, they are still the number one team in the Premier League. I see them kicking on this season and winning more trophies and I think they have every chance of winning the Champions League."